The Old Railway Bike Trail is a leisurely family bicycle trail during spring, summer and fall. During the winter, the trail is a multi-purpose winter recreation trail. For most of its 16 kilometre distance the trail follows the abandoned bed of the historic Ottawa, Arnprior, and Parry Sound Railway, opened in 1896 and decommissioned in 1959. The Old Railway Bike Trail runs from Rock Lake Campground to near Cache Lake. The Old Railway Trail is open for bicycling during snow-free times of the year, with the exception of fat biking during the winter (see below). During the winter months, the trail is groomed and trackset for nordic (cross-country skiing) as staff time permits. The trail can also be used to snowshoe, fat bike, bird watch, winter camp, skijoring (skiing while pulled by dogs), plus individuals or groups pulling toboggans and sleighs. Non-skiers should not disturb the tracksetting for skiers. See the current conditions. Easy. 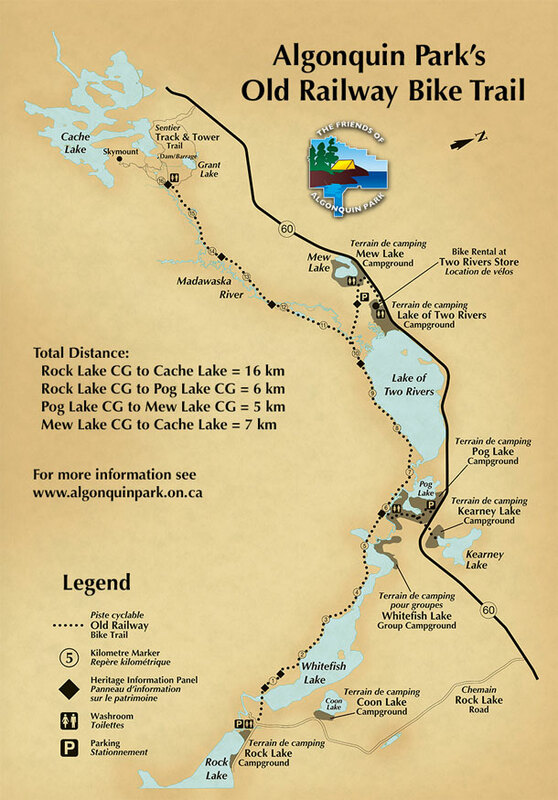 This is Algonquin Park's easiest bike trail suitable for families including children. The surface is level and hard packed having been a section of the now decommissioned Ottawa, Arnprior, and Parry Sound Railway. In winter, the Old Railway Trail is a great location for novice skiing because of its relatively level surface. Several interpretive panels along the route explain Algonquin's history. Click to enlarge the Old Railway Bike Trail Map below.